Part 1 of probably 50. I’m moving into my apartment in less than two months and I still don’t have tons of stuff, including a dresser. Well, I have the actual dresser but it’s an ugly color so I want to paint it. 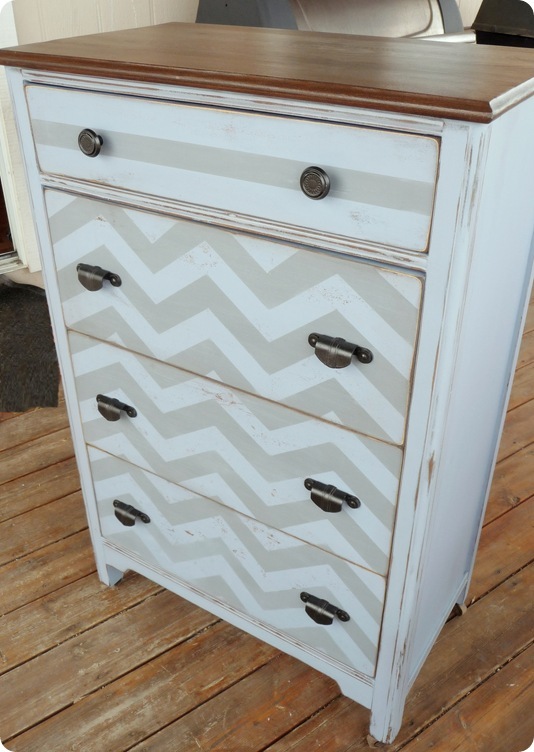 I saw this amaze-balls DIY dresser on Pinterest. But then I realized…I cannot do it myself. The website/blog said that they heard of someone using a cardboard cutout to do the Chevron pattern. To that, I say: WHAT?!? What am I supposed to do with the cardboard? Make a bunch of them, or use one? Please, be a little more vague. How do I paint using a cardboard cutout? Do I paint over it, or do I paint around it? Holy moly. This project is going to be impossible. If anyone is good at this stuff, please help me! I need a step by step, intricate, hold my hand explanation! I haven’t even started painting it plain white yet, hopefully the results of that won’t merit a blog post. But you never know. I’ll keep the updates coming, I might have to wing it and see how it goes. Oiy vey. I know that’s right. You have to use strategy with the guys. I have a craft room that needs to be re arranged and I have all these plans for it, but I need one simple little dresser moved to the other side….and I just had surgery…not going to happen without assistance is it? I broached the subject about 3 weeks ago… it’s still there. I swear that room is going to be so fly when….. Hang in there and errr maybe find some ‘easier’ projects….